JUST TWO HOME GAMES LEFT!!!!! The Railers are still in a battle for the final playoff spot in the North Division with just four games remaining. Worcester has two home games left at the DCU Center…. Don’t. Miss. Out!….On your chance to root on the Railers to close out their 2ndseason of ECHL action! Wednesday, April 3 – the Railers host the Manchester Monarchs at 7pm. Score $5 off any ticket at the DCU Center Box Office with your Price Chopper/Market 32 AdvantEdge card. Friday, April 5– the Railers travel to Portland to battle the Maine Mariners at 7:15pm. – coverage begins at 6:50pm on 98.9 FM Nash Icon. 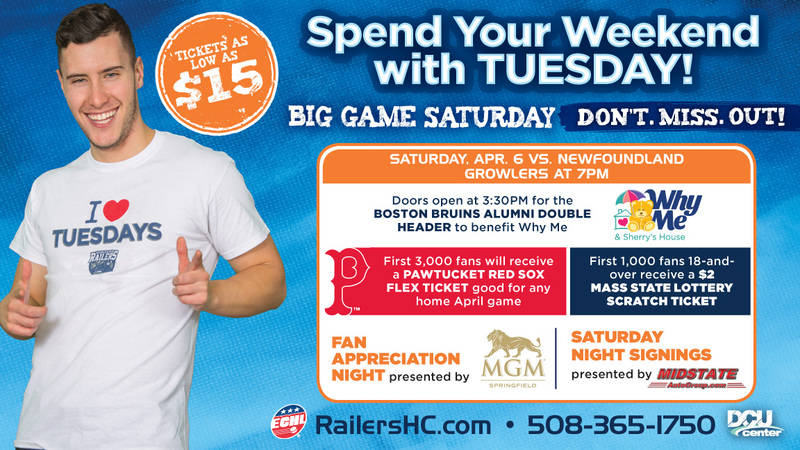 Saturday, April 6– BIG GAME SATURDAY…final home game of the season for the Railers….Fan Appreciation Night presented by MGM Springfield. Doors will open at 3:30pm for the Boston Bruins Alumni game to benefit Why Me. The first 3,000 fans will receive a Pawtucket Red Sox flex voucher good for any April home game and the first 1,000 fans will receive a $2 Mass State Lottery Scratch Ticket. Puck drop vs. the Newfoundland Growlers will be at 7pm as the Railers host their final home game of the regular season. As with every Saturday night Railers home game, Railers player(s) will sign autographs during the first intermission presented by MidState Auto Group. There will be a ton of in-arena giveaways and prizes throughout the game. The Railers will host a jersey auction at the game through the Handbid App for the orange third jerseys with fans having the opportunity to receive the jersey right off the players back on the ice during a postgame ceremony. In addition, Railers full season members will receive 25% off all purchases on Railers merchandise at the game with your member card. Sunday, April 7 – Railers travel to Glens Falls, NY to take on the Adirondack Thunder in the final regular season game of the season. Coverage begins at 2:35pm on 98.9 FM Nash Icon. https://railershc.com/wp-content/uploads/2019/04/WOR032819A_web_1152x648.jpg 648 1152 admin /_media/logo082018.png admin2019-04-01 12:32:422019-04-02 09:47:41JUST TWO HOME GAMES LEFT!!!! !